Vern Hoggatt, Jr. and Brother Alfred Brousseau founded the Fibonacci Association in 1963. Six years later, Time Magazine featured the two founders in an article on "The Fibonacci Numbers". Brother Alfred is quoted—"We got a group of people together in 1963, and just like a bunch of nuts, we started a mathematics magazine," The Fibonacci Quarterly. "We have a backlog of articles, and we've been accepted by the mathematical fraternity." Brother Alfred is pictured in the Time article holding a pineapple, which has well-known connections with Fibonacci numbers. The column tells of other natural occurrences of these numbers—male bees reproduce "Fibonaccially," and Fibonacci numbers occur in the spiral floret formations visible in many sunflowers, scales on pine cones, branching patterns on trees, and leaf-positions on branches. People who learn about the Fibonacci sequence, Brother Alfred said, "tend to find an esthetic satisfaction in it. They think that there's some kind of mystical connection between these numbers and the universe." The order to which Brother Alfred belonged is Fratres Scholarum Christianarum, meaning Brothers of the Christian Schools, or simply the Christian Brothers. Brother Alfred was received into the Order on July 31, 1923. He was assigned to St. Mary's College in Moraga, California, in 1930. While teaching at St. Mary's, Brother Alfred also continued his own studies, in physics, and in 1937 he received the Ph.D. degree from the University of California. In 1941, he was appointed Principal of Sacred Heart High School, and in 1959 in returned to St. Mary's College. 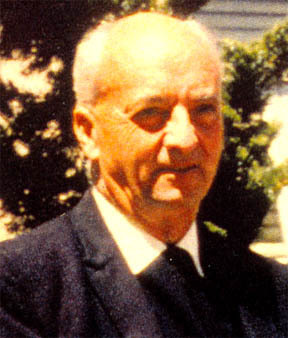 He served as Chair of the School of Science there for many years, and was active in the classroom and activities of the California Mathematics Council until 1978.
for providing the photograph of Brother Alfred.